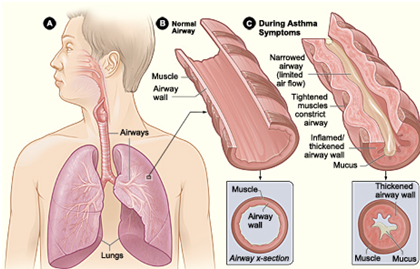 Asthma is a chronic (long-term) lung disease that inflames and narrows the airways. Asthma causes recurring periods of wheezing (a whistling sound when you breathe), chest tightness, shortness of breath, and coughing. The coughing often occurs at night or early in the morning. The strongest risk factors for developing asthma are a combination of genetic predisposition with environmental exposure to inhaled substances and particles that may provoke allergic reactions or irritate the airways. Asthma affects people of all ages, but it most often starts during childhood. People who have asthma have inflamed airways. This makes them swollen and very sensitive. They tend to react strongly to certain inhaled substances. Figure A shows the location of the lungs and airways in the body. Figure B shows a cross-section of a normal airway. Figure C shows a cross-section of an airway during asthma symptoms. Common signs and symptoms of asthma include: Symptoms may occur several times in a day or week in affected individuals, and for some people become worse during physical activity or at night. Coughing: Coughing from asthma often is worse at night or early in the morning, making it hard to sleep. Wheezing: Wheezing is a whistling or squeaky sound that occurs when you breathe. Chest tightness: This may feel like something is squeezing or sitting on your chest. Shortness of breath: Some people who have asthma say they can't catch their breath or they feel out of breath. You may feel like you can't get air out of your lungs. Recurrent asthma symptoms frequently cause sleeplessness, daytime fatigue, reduced activity levels and school and work absenteeism. Asthma has a relatively low fatality rate compared to other chronic diseases. Quit Smoking- To help you quit, there are many online resources and several new aids available from your doctor or health care providers. It is also a good idea to get a flu shot every year, since the flu can cause serious problems for people with Asthma. Visit Your Doctor or Health Care Provider on a Regular Basis to avoid complications and hospitalization. Reduce stress -try to avoid things that cause you stress. 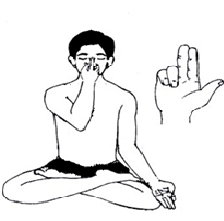 You can also try pranayam and yoga under guidance to improve lung function. Allergic Bronchopulmonary Aspergillosis (ABPA): If you have asthma, the first noticeable symptoms of ABPA are usually progressive worsening of your asthma symptoms such as wheezing and shortness of breath. Chronic Obstructive Pulmonary Disease (COPD): Chronic Obstructive Pulmonary Disease (COPD) is a group of lung diseases (including emphysema and chronic bronchitis) that block airflow in the lungs. This makes it increasingly difficult to breathe. Many of the symptoms of COPD are similar to asthma symptoms. Gastroesophageal Reflux Disease (GERD): Asthma flare-ups can cause the lower esophageal sphincter to relax, allowing stomach contents to flow back, or reflux, into the esophagus. Consult your doctor if your symptoms worsen. See your doctor or health care provider regularly even if you are feeling fine. 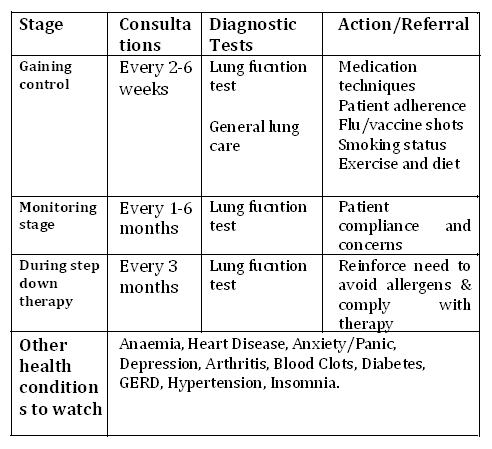 Partner with your doctor to develop an asthma action plan. This plan will help you know when and how to take your medicines. The plan also will help you identify your asthma triggers and manage your disease if asthma symptoms worsen. Make a list of your breathing symptoms and think about any activities that you can no longer do because of shortness of breath. Be sure to bring a list of all the medicines you are taking to each office visit. The most damaging consequence of lung disease and its sensation of breathlessness is the development of an inactive lifestyle. For many patients, activities of daily living, like bathing and dressing, can create overwhelming fatigue. Air hunger can create panic attacks, and produce negative psychological effects. People with chronic respiratory problems sometimes limit their physical activities in an attempt to avoid shortness of breath. The lack of exercise works against you; inactivity weakens your muscles and they become less efficient. Regular exercise strengthens your muscles and makes them more resistant to fatigue. A healthy diet includes a variety of fruits, vegetables, and whole grains. It also includes lean meats, poultry, fish, beans, and fat-free or low-fat dairy products. A healthy diet is low in saturated fat, trans fat, cholesterol, sodium (salt), and added sugar. Eating smaller, more frequent meals may prevent stomach fullness that can make it harder to breathe. Be active and involved- work and play! It is important that you don't let asthma affect your movement and routine. Seek support to carry on your work, social engagements and personal commitments. This will keep you emotionally healthy and also keep asthma symptoms at bay. Just knowing that there is someone out there that knows how you feel is comforting. Share ideas, share fears, and share joys. Watch your weight in both directions. It is important for you to consume enough calories to produce energy in order to prevent wasting or weakening of the diaphragm and other pulmonary muscles. At the same time it is important to be fit to breathe easier. 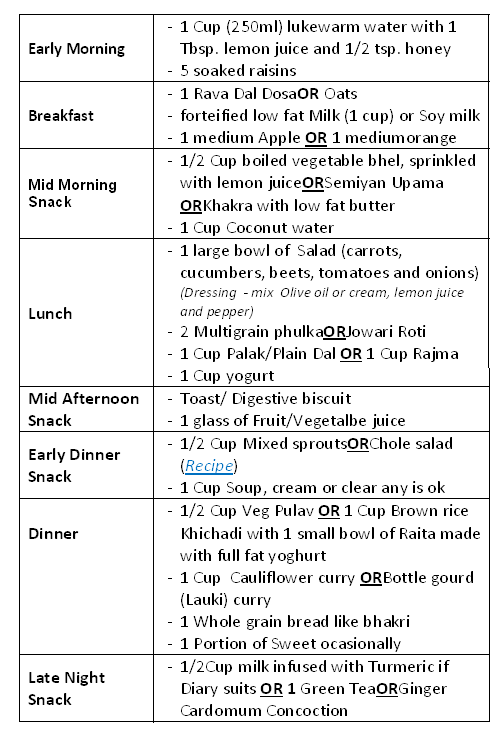 The good news is that most people with asthma do not have to follow a special diet. Research has shown that people who ate the most fruit and vegetables had the healthiest lung function. Vitamin C and E are also believed to help reduce the severity of the inflammatory response in the lungs of people with asthma. A diet that includes a high level of nutrients can also boost the immune system and help ward off colds and flu - both common asthma triggers. 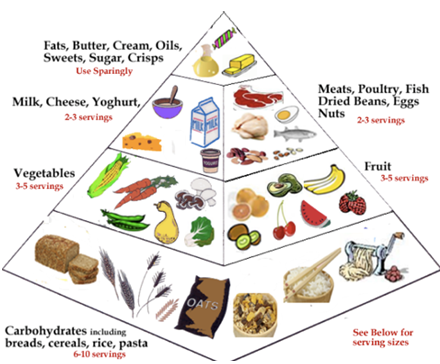 Base your healthy eating plan around a variety of foods, including fresh fruit and vegetables, grains and cereals. It is recommended that you eat five portions of fruit or vegetables every day and drink plenty of water. Low-fat protein foods such as lean cuts of meat, poultry, and fish - particularly oily fish like salmon, mackerel, and sardines. Whole grain foods such as whole grain bread, bran, brown rice, and oats. These foods are also high in fiber, which helps improve the function of the digestive system. Fresh fruits and vegetables. They contain essential vitamins, minerals, and fiber, which will help to keep your body healthy and fight infections. Drink plenty of fluids throughout the day. Adequate hydration keeps mucus thin and makes it easier to cough up. Losing weight can help in managing asthma, and combined with a more active lifestyle, can also help to improve lung function. In some cases, certain foods including cow's milk, eggs, fish, shellfish, yeast products, nuts, and some food colorings and preservatives, can make symptoms worse. Too much salt causes water retention, which may affect your ability to breathe. Be sure to check the labels of the foods you buy and avoid any containing more than 300 mg of sodium per serving. People with asthma are also recommended to avoid products with artificial colours(see food labels) as they may trigger symptoms. If you think you have a food allergy, contact your doctor or nurse for further advice. Do not add SALT while cooking or as seasoning. Quit smoking and cut down on alcohol. Limiting sugar, caffeine, and alcohol can promote health and reduce stress. Take your diet and exercise plan seriously. Exercise both your arms and legs. You might use a treadmill, stationary bike, or weights to do your exercises. If you can't handle long exercise sessions, your plan may involve several short sessions with rest breaks in between. While you exercise, your team may check your blood oxygen levels with a device that's attached to your finger. One way to help prevent symptoms like shortness of breath is to find easier ways to do daily tasks. ALWAYS KEEP YOUR INHALER IN HAND WHILE DOING EXERCISE AND TALK TO YOUR DOCTOR BEFORE TRYING OUT NEW EXERCISES. These tips include ways to avoid reaching, lifting, and bending. Such movements use energy and tighten your abdominal muscles, making it harder for you to breathe. Stress also can use up energy and make you short of breath. DRINK PLENTY OF WATER WHILE DOING EXERCISES. Pursed-lip breathing decreases how often you take breaths and keeps your airways open longer. This allows more air to flow in and out of your lungs so you can be more physically active. Always breathe slowly to save your breath. Inhale through your nose, keeping your mouth closed. Exhale through pursed lips.Include the following in your exercise routine. Stretching:It helps prepare the muscles for activity and helps prevent injury and muscle strain. Regular stretching also increases your range of motion and flexibility. Cardiovascular or aerobic: This type of exercise strengthens the heart and lungs, and improves the body's ability to use oxygen. 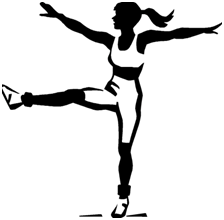 Aerobic exercises include walking, jogging, jumping rope, bicycling (stationary or outdoor), cross-country skiing, skating, rowing, and low-impact aerobics or water aerobics. Strengthening:Strengthening exercises for the upper body are especially, as they help increase the strength of your respiratory muscles.